String crossing is an incredibly important fundamental of our technique. I am quite insistent on the importance of good string crossing because it is one of the most overlooked techniques by beginners and can hinder the beginner guitarist with some terribly bad habits. There are two issues that we will talk about with string crossing, and they are intertwined with one another. When it comes to string crossing we are going to encounter two factors that will greatly aid our technique. Accuracy and consistency. As the left hand is experiencing some relatively new movements you want to make sure that you are training the hand to build the best fundamental technique you can get. At the moment you might find yourself missing strings, hitting strings you never intended and also getting a wide variety of sounds. So lets begin with some really basic movements to train our hand to cross the strings. To start off with, we can simply practice crossing the strings with one finger at a time. In these exercises we are aiming for accuracy. Be accurate with your placement of your finger, and make sure you start with the same part of the finger each time. Also, be consistent with the angle of your finger. To keep the finger angle consistent you will need to move your hand across the strings as you play. This isn’t a big movement, as the distance from the sixth string to the first is really not that far. Think of your right hand smoothly hovering from one string to the next, allowing the finger to remain relaxed an in the same position. Next up comes alternation. We still have to be mindful about accuracy of placement and consistency of sound, but now we have the added challenge of alternation. The most important thing to be aware of here is to ALWAYS ALTERNATE. The most common mistake is to repeat fingers. Usually a repeated finger will come after crossing a string, because crossing a string offers different movements depending on the direction you are traveling. Our fingers are not all the same length, (if they were perhaps things would be a little easier on the guitar!) so there are some movements that come naturally and some that we have to work at. Tremolo, for example, is particularly effective on the guitar because the motions suit our hands in a very natural fashion. In general it will be easier for the m finger to cross the string towards the first string, and more difficult towards the sixth string. The I finger enjoys the opposite. It will travel easily from 1st to 6th but with more difficulty from 6th to 1st. Because of all this, when crossing string with alternating fingers we can unconsciously repeat a finger in the right hand instead of alternating. This will cause tension in the right hand and you will lose accuracy. 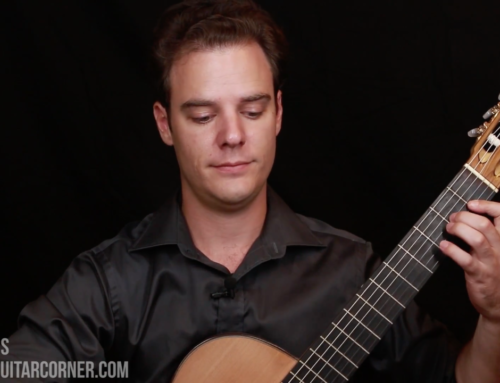 Move your hand across the strings in a smooth and controlled movement. Compensate the angle of the wrist as you get to the bass strings. Play in a steady rhythm. Your metronome can be set to 60 or slower. The overall goal with this training is to get your right hand to know the strings so well that you have no need to look at them at all when playing. Like turning on a tap in the dark, or opening a car door, this needs to be so familiar that you do it without thinking, and correctly each time. Just because these exercises seem simple, don’t underestimate the importance of them, because if you are going to build a good technique, the foundation is right here. Remember, thoughtful practice makes perfect. This seemingly simple study is actually full of musical devices. In the first four bar phrase be very mindful of correct alternation between i and m. Just because the first two bars have the same notes doesn’t mean that you are using the same fingers! String crossing and alternation are both covered in depth as a part of the Level 1 Technique & Musicianship Video Course in our membership packages!